We are pleased to be able to offer the Starlight Instruments Focuser Boss II Electronic Focusing Control Kit for digital focusing of our telescopes. This wonderful system allows computer controlled focusing to be added to our 2.5" Stowaway focuser, 2.7" (27FOC3E-FT and TFOC3E-FT ) and 4" (4FOC3E-FT) focusers that are fitted with the Feather Touch Micro. It is also compatible with the Riccardi-Honders 3.5" Focuser (PDM version only). This superbly CNC-machined, all aluminum kit is a worthy addition to your Astro-Physics scope. The ergonomic Hand Controller is convenient, whether you’re at the eyepiece, or choose to manually focus your imaging. Intuitive software works invisibly with your autofocus programs, such as FocusMax™, when you want to sit back and let the computer do the work. The kit is available with a choice of two different motors. Both consist of a Control Hub, a Hand Controller, a motor (either the high-torque HSM Motor or the heavy-duty Posi Drive Motor) and the required cables. Your choice of AC transformer or 12 volt DC power connector is also included. The HSM (Handy Stepper Motor) motor takes motorized focusing to a new level. Its radical design allows you to switch from motorized to hand focusing by a simple twist of the motor housing. By utilizing the reduction assembly for attachment, it provides high precision focusing. The high-torque motor provides all the power needed to lift your camera / filter wheel combo. Each unit incorporates a built-in temperature sensor. 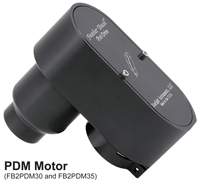 The PDM (Posi Drive Motor) motor is designed for the heaviest imaging packages. This new motor connects directly to the pinion shaft of the focuser and not the reduction assembly, which eliminates any slip and offers precise repeatability with heavier payloads. It has been tested with loads up to 56 lbs.! The PDM has 24,000 steps of the motor per turn of the focuser pinion for extremely fine resolution. 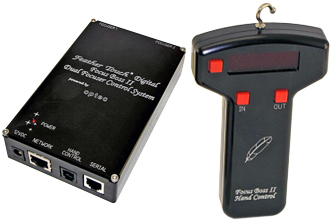 A drive disconnect system is built in should you need to switch to manual focus without dismantling the system. Each unit incorporates a built-in temperature sensor. Note: The Riccardi-Honders requires the use of the PDM motor, rather than the HSM motor, due to the dimensional restrictions of the scope's handles. This only applies to the Honders. Power Choice (not shown): Ships with12 volt DC lighter plug. AC transformer is available upon request. 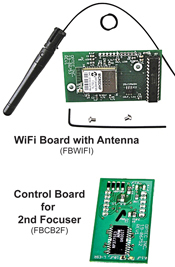 The WiFi upgrade is a wireless option that allows you to use your Smart Phone or IPAD (examples) to control the focuser without a need for the hand controller. Note: must be ordered at time of Kit purchase to allow installation. This upgrade allows you to control 2 focusers simultaneously. Note: must be ordered at time of Kit purchase to allow installation.